Following Gideon Osborne’s Autumn Statement the political parties have been arguing over the detail while all of them accept the need for ‘austerity’ measures. 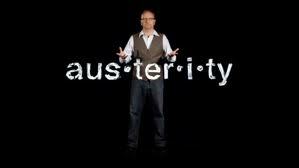 Here is a short, clear and funny video by US based Scots academic Mark Blyth exposing the nonsense of austerity. It also raises some serious questions about the distinction between public and private debt and the class politics that are driving this policy internationally. I’m also looking forward to Mark’s book on austerity which is published early next year.